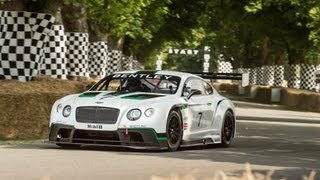 Bentley has unveiled the Continental GT3 race car, a racing machine, at the 2013 Goodwood Festival of Speed. 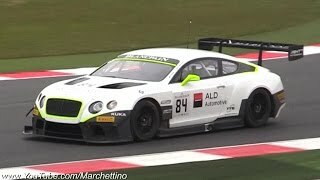 The 2014 Bentely Continental GT3 race car is the production version of the GT3 Concept car unveiled at the 2012 Paris Auto Show. The exterior of the car features a comprehensive aerodynamic package which includes a carbon fibre rear wing and a carbon fibre splitter. A double wishbone suspension configuration front and rear, fitted with four-way adjustable racing dampers, replaces the standard road-car air springs. . Revisions have been made to the bonnet, bumpers, fenders and sills. 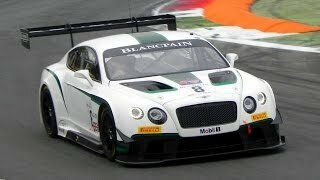 Despite the race-specification, the GT3 remains a hand-crafted Bentley, with the steering wheel, door pulls and seat all hand-trimmed and stitched by Bentley craftspeople at Crew. 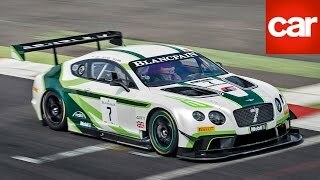 The race car model is powered by Bentley’s powerful but efficient 4.0-litre twin-turbo V8 engine delivering 600 bhp. 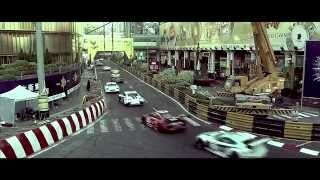 The V8 provides the GT3 race car with highly competitive power in a compact and lightweight package that’s perfect for racing. Power is transmitted to the rear wheels via a carbon fibre propshaft to an Xtrac six-speed sequential gearbox.